Sage 2200 Series on sale, starting at $99.99! Good for 2210,2230,2250 and 2280 Reels. 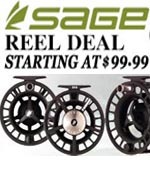 Click banner to go to Dendiscounts.com for Reel Deal and save today!